Margaret Anderson (photo)(1886-1973) and Jane Heap (1883-1964), partners and free-thinking literary figures, for founding, editing, and publishing The Little Review, an avant-garde magazine that featured works by some of the most influential modern American and English writers between 1914 and 1929. See Jane Heap for her photo. 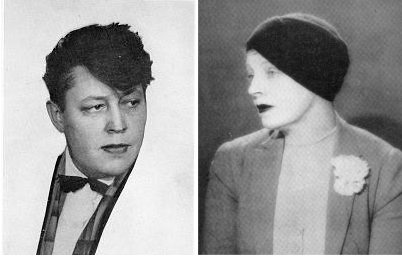 This couple were key figures in Chicago’s literary renaissance of the early 20th century. As co-editors of the celebrated avant-garde journal The Little Review, they provided an early forum for some of the era’s greatest writers and thinkers, including Emma Goldman, Amy Lowell, T. S. Eliot, Gertrude Stein, Sherwood Anderson, Ernest Hemingway, William Butler Yeats, Hart Crane, Ben Hecht, and Ezra Pound. Their professional and personal partnership was centered in Chicago for only a few years, but their impact was far-reaching and historic. Margaret Anderson’s life was marked by rebelliousness and a search for creative stimulation. Born in Indianapolis in 1886, she came to Chicago in 1908 and became immersed in the city’s nascent literary community. Dissatisfied with available outlets for the wealth of creativity emerging here and elsewhere, she launched The Little Review in March 1914. Operated from a small office in South Michigan Avenue’s Fine Arts Building, the magazine had trouble in attracting financial support but did not lack for written contributions. Its pages were open to a diverse range of literature, poetry, and philosophical and political views. At one point, to keep The Little Review afloat, Anderson forsook her spare Ainslie Street apartment to set up a tent camp on a Lake Michigan beach. In 1917, after a brief sojourn in San Francisco, the couple settled in New York City, where the magazine grew not only in attention but in notoriety. It began the first U.S. serialization of James Joyce’s Ulysses in 1918. The post office seized several issues, and the couple were later arrested at the instigation of a “vice” crusader. They were found guilty in 1921 on indecency charges and were each fined $50 in an internationally publicized trial. After moving to Paris in the 1920s, Anderson and Heap’s relationship began to wane. Increasingly, it was Heap who produced the legendary magazine on an irregular schedule as she had resources. It last appeared in 1929, but both women separately continued as respected figures in Paris, London, and New York lesbian communities as well as becoming active in circles devoted to Eastern religion and philosophy. Heap, who was born in Topeka, Kansas, in 1883, died in 1964 in London, where she had moved after The Little Review’s cessation. Anderson, who wrote several books, died in Le Cannet, France, in 1973.